The air is still and cautious. It exists in a place in which time has no power. Nothing moves here, nor dares stir. Not the slightest breathe of a breeze flows through the distance. Piercing the solitude, orange-grey light begins to peek over the mountaintops, the swirl of the crisp early dawn tossed carelessly across the great canvas of empty sky. If it could have a taste, it would have been sweet. Within it, soft remaining moonlight reflects from the wispy smattering of cloud below, hung in suspended saturninity for the passing of the night. The atmosphere is silent as the grave, and as I circle overheard, I feel the gentle pick up of moved air, a heavy presence of a terrible thing carried on the soft breeze. Through the peaks of the mountains I fly, between the majestic trees whose branches, outstretched in attempts to reach eternity, scrape the varying horizon. I glide between them, my strong wings softly quivering under the pressure of the atmosphere. Even as the colour of the dawn leaks over the horizon, the night still holds reign, and the dark air encompasses me, surrounds me as completely as the night itself. I fly over the snow peaked mountains, the moonlight glinting serenely off the crystals that no other eye but mine shall ever see. I am the Raven of the Snow, the white shadow that soars in the darkened night sky. Down the mountainside I travel, the wind pushing past my face and beading off my white wings as gracefully as a dolphin dances through water. This empire is my home; its secrets, my heart. So long have I dwelled here that the very pulse of this place beats profoundly in my soul. We are one, this realm and I. I am as much a part of my empire as it belongs to me. So far down the mountain I go, with only the pale, reflected sunlight and my blind instinct to guide me. I know the way well, my eyes are but a courtesy in the navigation of my heart. Down, beyond the vast reaches of the mountainous range sits a valley. Untouched for millennia, save for the gentle rays of the Sun that fall upon it, remained this land. Untouched until the day they arrived. The meadow the colour of bright emeralds carpets the valley, the golden light of the Sun making it turn alive with shimmering brightness and lush undertone. The massive valley is impressive in its own right, but set against the backdrop of the looming mountains that surround it, it is reduced to a small gem, nestled between giants. Encompassing the jade valley lays the forest, its depths incomprehensible to even me; the beauty of it like the depths of the ocean- brilliant and stirring. The power of this place stirs my soul; what mystery lies here I shall never comprehend, as there is power greater than myself that dwells within, a power that I respect too greatly to enter. My eyes fall upon the two snow peaks- twins- of the mountain that is the gateway to the valley. My wings carry me through the borderland and out beyond the bounds of the mountains. The clouds rise up above me as I gaze down at the land that calls my soul. It takes but a glance to see that the calling that pulled upon my heart was true but what was wrong, I could not tell from my height. I descend further, the intrigue becoming something greater, something darker. As I taste the night air closer to the ground, the images below begin to come into a clearer view. Below is a smattering of dark images strewn across the earth, enough to taint the brilliant emerald grass that I could on nights before still see with my eyes, and feel with my heart. But something was wrong now. The sweet smell of life was void, the shimmering presence of mystery, diminished. Heart pounding, I ride the air down, into the heavy atmosphere over which even the Sun itself did not want to break. As my eyes focus on the images below, the blasphemy presented itself, and the scene of which I witnessed will haunt me for lifetimes to come. Armoured and lifeless, they’re strewn across the emerald sea. The dark liquid seeping out of them poisons the ground, turning it black, choking the life from the earth itself. They litter the land, sprawled upon every place the light would touch. Their weapons- spears, swords and spikes- thrown without regard, covers the land. They stick out of the bodies of some, their faces twisted in the grimaces of death, the air gone cold from their lungs. Their fingers outstretched, reaching for what hope might have been left in those final moments. Dirt mixed with their blood and the mud is thick and carries with it the smell of decay. The air hangs densely overhead, and I can taste the stench of death in my nostrils. It is bitter, heavy. The bodies lie from the edge of the forest to as far as my eye can see… no one had been spared. They had exterminated each other. Every last one of them, dead. I circle over the scene of destruction, a sense of panic taking over me, yet hopeful to find vitality amongst the ruination. But as I fear, none had within them the breath of life. Below, my eyes fall upon men, brave and strong, utterly defeated in his quest of hatred. I see the bodies of women, naked and pregnant, the bodies of children, unarmed and afraid. The echo of their frightened cries plays tricks in my mind, and I search for survivors until I can look upon the face of death no more. From out of the silence, I hear a cry- a long, pained, mournful cry. It’s a lament so burden-laden that the sound of it wretches me, makes my insides want to spill out in a burst of emotional agony. It’s the sound of desperate longing, of the end of the world, the end of life, the end of hope. Within the culmination of my awareness, I realize the wailing is my own, and as my wings lose their strength and I spiral down toward the cold earth, I feel the warm sting of destitute tears on my cheeks. What have they done… what have they done? The earth hits me like a force I’ve never known. Gravity tears me from my skyward domain and pulls me onto the torso of one of the cold bodies. Hurriedly I try to scramble off of it, but my wings slide on his blood stained face and I can’t find grip enough. I match the horrendous grey eyes staring aimlessly up at me, and out of instinct, I flap my wings, trying to get out of his paralyzing cadaverous gaze, but I only slip faster and tumble down into the blood mud. Heart battering in my chest, my mind swirling in unformulated questions and panting, I lay there for a while. There are so many of them… is there no mercy here? I brave a second glance at the body I had refusedly mounted, his eyes blankly focusing on the stars in the night air above. I am overcome with grief, a sorrow so deep I fear that I may too die here on this cold ground. Their hatred had killed them, and it will kill me too. Consumed with my sadness, I feel all faith leave my body, inch by excruciating inch. I allow my tears free reign over my control, and they come heavy and bountiful, until there is nothing left to mourn. Worn and depressed, I lay on the ground, and I watch the Sun rise, the first rays stretching through the peaks of the mountaintops. The light passes from a soft dawn to its orange hue with ease; dawn to full light, yet I see not the beauty in it. With hopeless eyes, I watch as it raises the day and passes quietly overhead. The light is different today, it is saddened somehow, but I do not want to see what it would show me. So I remain on the ground and mourn instead. I watch as the only movement on the earth is the bright star passing me by, and I watch as it slowly sinks beyond the peaks once again, leaving me alone with tears and darkness. It is in the darkness that light comes to me, but the light is not what I had expected. It begins slowly with a memory of a time long since passed, like a dream that rises from the foggy memory of sleep, yet gains promise with each passing minute of conscious thought. A legend of hope passed down from my kind through time and space and generations. It is the aspiration of a new day, for as long as the Sun would rise and fall, there would be reverie for life to exist. The memory turns into a glimmer, the glimmer becomes a spark, and as I anxiously take watch for dawn’s first light, the spark begins to grow into a flame- small and weak, but a flame nevertheless. The dawn begins to peek through the mountainous trees on the tall horizon, but as I wait with bated breath and anxious eyes, the light, instead of gaining strength and growing bigger and brighter, grows dim and distant. And just as gently as it kisses the peaks of the horizon, the light begins to recede. The light stops, no longer pulling away, but hesitant to come any closer. I fight my way out of the muck I’d become part of, and frantically coerce my wings to lift me into the sky. Up, up, up, further I fly, chancing not a glance back down to where I had come from, afraid that the tiny glimmer of hope within my soul would be shaken so deeply by the sight of the hell below me. And so I fly, faster than I’ve ever flown before, headstrong to catch the Sun before it leaves me once again. Up, I fly, across the great poisoned emerald sea, up the lift of the land and through the twinned peaks of the snow-capped eminence I had once called home. I fly through the days and past the nights, but yet the Sun does not move. I fly through seasons come and seasons gone. I fly for years extended into more years, yet the Sun does not move. I push my wearied wings harder than I ever have, beyond doubt and exhaustion and fatigue and starvation. Finally, I reach the top of the mountains; pristine, clear and cold, they stand in admired silence. I pass the threshold of the zenith and began my descent the other side, where the Sun somberly hangs. The Sun radiates its answer in language that is not spoken, nor heard, but felt. The power of its words burns both my soul and my wings as I hear them. The Sun resumes its descent, down, below the crest of the mountains and into the world beyond my reach. Without hesitation, I fling myself into its wake, the light so bold and brilliant, it blinds my sight. It pulls me into it, its unseen arms outstretched, claiming purchase on my body, tearing at my flesh so violently that I feel as though it is ripping me apart. It pulls me into its fire, into the burning land of wind and flame. As I near its surface, I open my eyes through my fear. At once they burn, the pain blinding, but my will is stronger than my sight and as I plunge down into a lake of fire, I feel the sheer power of the Sun encase me. For a moment I fear I will die in this place, a ruin amongst gods, but the flicker of hope, borne of mourning, had gown powerful within my spirit, the promise of renewal driving my will to live. Deep into the unrestrained flaming core I immerse myself, at last finding my prize. And so I fear no more. I push my wings with all my might, my feathers burned and turning to ash. My eyes are charred and my body seared by flame. My tears cool not my face, but evaporate on my cheeks. I can feel my beak burning, but the single ray of sunlight that it held was too precious to abandon. Still I propel myself forward. They needed light, and without it, all hope would finally be lost. So with one last, mighty protest, I eject myself from the grip of the Sun, and with a piece of it in my beak, I race forward, back toward the land from which I came. The fever of the ray too intense, I toss it upon my wings to carry. I travel through seasons and years once more to return finally to my home, my land that had been bitterly cast into shadow. The burden I carry is innumerable and the years beneath its weight weakens me. But finally, as a beacon through the darkness, I see appear the gloriously familiar twin peaks, the sight of them the most beautiful thing I have ever seen. With the most determination I have ever felt, I hurtle myself between them, and before me appears the valley beyond. With the last ounce of strength my body can muster, I throw the Sun’s ray over the land, the light exploding the darkness that had settled for years. I throw it with all the love I have ever witnessed, I throw it with all that was pure and good and living. I throw it with the desperation of a life on the brink of some eternal darkness, reaching madly out for a grasp at life. I throw it with all the hope in the world. The ray unfolds and multiplies itself across the valley, saturating every tree, every blade of grass, every rock that had tumbled down the mountain side. I feel it energize my wings. I’ve returned their life. I’ve given them another chance! I believed in them so strongly and now they can learn to live, learn to love! I descend faster than I’ve ever gone before, my heart beating so wildly with excitement, I feel as though it will explode with joy. But as I approach the ground, feel my heart begin to sink. Below me are no dancing men and women. There are no children running after each other in play. There is no music, no singing, no sounds of laughter. There are no sounds at all, but the echo of the sound of my heart breaking. The bodies remain as I had left them, their skin and muscle gone, claimed by years of decay, revealing only a grisly sight of a graveyard of bones. Empty mouths hung open in silent agony, accustomed to the darkness, protesting the new light. The emeralds that had once reflected the golden sunlight beneath them have turned gray and reflect now only the chasm that has taken over this land. The clear rivers were dried and gone, reduced to dust and stone. The trees that once held a brave power over this land were reduced to twisted roots escaping the ground, confused fingers reaching up toward the sky, begging the Sun to return. The colour is gone, the prestige once magnificent, now abandoned, a lifeless landscape that drew no appeal. To see humanity in the darkness despite the trials I had endured to deliver them resurrection breaks me. It breaks my spirit, my soul. The burden of the light had worn me down, it had changed me. I turn my head to look upon my tangled aching wings and the sight of them surprises me. They had turned a brilliant, charred golden, the colour imposed upon them from the powerful ray they had been carrying for so long. I cry out, wanting life to go back to how it used to be, when things were light and colourful and alive. But there was no going back now. What’s done is done. Consumed by the burden of the light and its repercussions, I finally give up. I spiral down, down, down into the ground, into the soft earth which had once been full of life and full of possibility. The question rings loudly in my head. Why did they choose death instead of life? Why couldn’t they understand? Why must I have been burdened with the weight of their mistakes when it was them who needed the lesson? For so long I had tried to understand their minds, to know their hearts but it was impossible to know human nature. 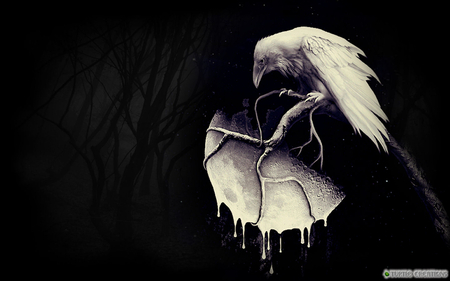 My raven heart knew not of such things as greed and evil and power and hatred. The sad truth of reality fills my heart with lead. What I have witnessed can never be undone, it can never be changed. And so I fall. I let the only living thing in this place consume what was left of me. The gravity coaxes me in, and as I fall, I feel my mind slip away. I allow my body to swirl and twist and fall as it may. I catch a glimpse of my wings, the light of the Sun carved into them, as I turned over and over in the sky, the heavy ground circling beneath me. The golden feathers catch the light and gleam in my eyes. Suddenly, the answer is clear. If I am to continue to breath, I must know balance. As gravity pulls me to my death, I spread my broken wings once more. They catch the air underneath them, lifting me, and I begin to circle around and down. With anguish in my heart, I steer my scalded body toward the tar of the darkness of humanity, the massive pools lying across the land where sunlight had once reigned. Onward I glide, dipping one wing into the tar, staining it back as cold night, black as the hearts of whom had lived here once. Upwards I turn, and crying out to the empty atmosphere my final wish to know love, I thrust myself back into the scorched sky, damned for an eternity to seek knowledge, to find others like me. I leave this land, this once-paradise, for all who live here now are the dead. And so with a broken heart and a tear stained face, I fly. Amongst the stars and over the seas and through the valleys I search the skies for eternity. Through the ages and beyond the years I roam, contemplating balance. And so for ever long shall I soar over humanity, a strange bird of prey, one wing dipped in gold, the other in tar, searching for ever living love, grasping at understanding, pleading for enlightenment. May the stars grant me fruitfulness in my journey, and may my restless heart one day be at ease. May I someday forgive the evil that has bound my wings. This entry was posted on Tuesday, September 3rd, 2013 at 11:22 pm	and tagged with balance, courage, hope, Immortality, love, Raven, salvation and posted in Drawn Into The Flame. You can follow any responses to this entry through the RSS 2.0 feed.